According to a new report from Strategy Analytics, the sales of smartwatches in the fourth quarter of 2015 outpaced sales of Swiss watches for the first time. 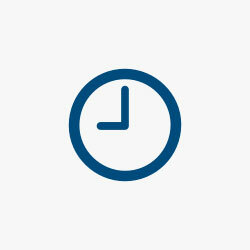 The company claims that during the holiday quarter, a total of 8.1 million smartwatches were shipped, while 7.9 million Swiss watches were shipped. Of those 8.1 million smartwatch shipments, Apple and Samsung led the way. The former accounted for 63 percent of the market, coming out to roughly 5.1 million units, while the latter held 16 percent, or 1.3 million units. With 8.1 million smartwatches shipped in the fourth quarter of 2015, that’s a 316 percent increase over the 1.9 million units shipped in Q4 of 2014. Obviously the big difference between the two years here is that Apple Watch was released in April of 2015, so Android manufacturers and companies like Pebble were the sole manufacturers in 2014. 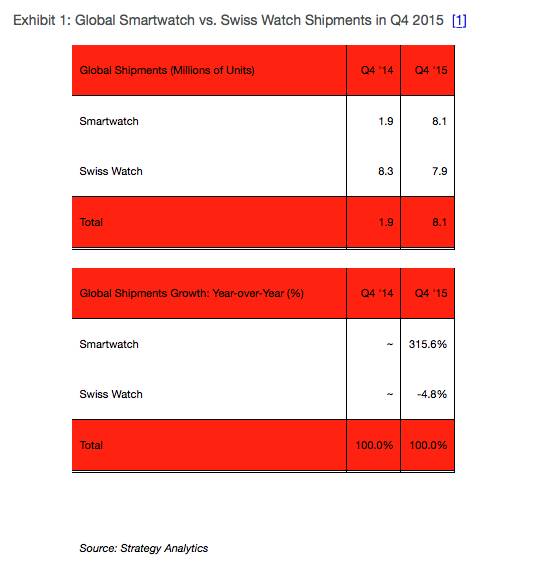 In Q4 of 2014, Swiss watch shipments were at 8.3 million, meaning that shipments fell by 5 percent year-over-year to the 7.9 million shipped in the 2015 holiday quarter. The report notes that smartwatches manufactured by Swiss companies, like Tag Heuer, accounted for just 1 percent of the smartwatch.